The driving force behind the transformation of Miami Beach’s Sunset Harbour, Scott Robins, is taking Deco Drive by storm – his way. Reimagined into an animated and energetic retail and restaurant hub home to eateries including NaiYaRa, Lucali, jugofresh, and Pubbelly, Robins took what was once a light industrial district and turned it into the beach’s hottest neighborhood. And now, he’s at it again. With a project to revitalize the historic Española Way - the first commercial street in Miami. So we sat down with Robins to hear more about his plans for this renaissance of what was once a Mediterranean Spanish Village, developing Sunset Harbour, and his plans for the future opening Wynwood’s first groovy, art-focused hotel. Tell us about the renaissance of Española Way! SCOTT ROBINS: It’s actually grown very organically. I’ve owned Española Way since 1991 and it’s been so many different places from the time I bought it to what it is now. 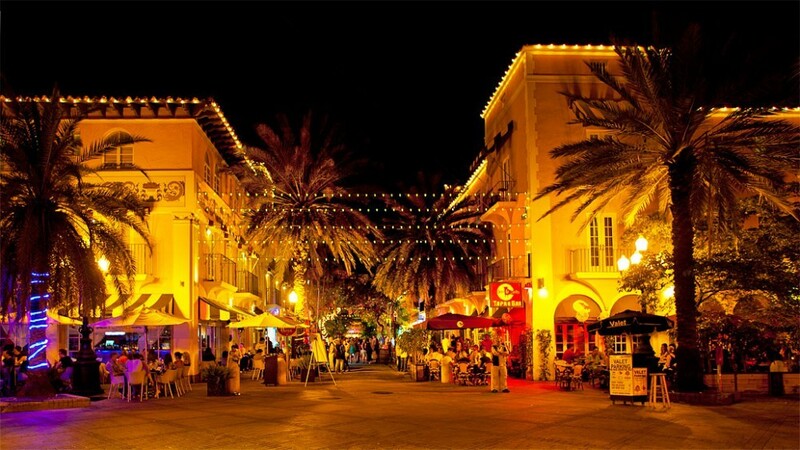 Española Way was the original commercial street for Miami Beach, built in the 1920’s. It was the place where everyone came for bohemian experiences. But like everything in Miami Beach, it fell into disrepair. And when I bought it in 1991, it was prostitutes and drug dealers. None of these restaurants and stores were here. And really organically, over time, for me, I like to feel an area and see where it’s going and nurture the progress. And on Española Way, it’s been as long a process as I’ve ever been involved in, in real estate. Why has the process of developing this street taken such a long time? SR: It’s a complicated street. We have hotels, restaurants, and retail stores. It’s a major pedestrian street. We’ve been building it tenant by tenant, store by store, hotel room by hotel room. And it hasn’t happened quickly. Española Way was always kind of a place where things just happen slow. So it’s been over 25 years since I’ve owned the property and just now I can honestly say that it’s gotten to the point where I think it’s beginning to reach its full potential. Now we’ve settled into a great group of people. They’ve been here for about 10 or 15 years and we’ve sort of all grown up together on the street. Everyone recognizes how special this street is and how honored we all are to be part of this street and the history of this street. You mentioned that Española Way is a street with a storied history. Tell us about the DNA of the neighborhood and its tenants. SR: We have Hosteria Romana. Owner, Marco Efrati is the mayor of Española Way! He has been here the longest, he’s in the center of the street, he’s got the best food, and it’s the happiest loudest place that you could ever be. Everyone that goes there gets an incredible experience – food, entertainment, service. We built Española Way tenant by tenant and we really built it on Marco, and the kind of food, service, and atmosphere he provides. What’s your favorite Italian dish at Hosteria Romana? SR: The grilled seafood platter. With this notable lane’s makeover underway, what new vendors can we look forward to seeing in the near future? SR: Vacancies on this street don’t last very long so we’re pretty much full here! We just opened a new gourmet hamburger restaurant and we’re replacing a couple of our retailers with new retailers. Scott, in addition to restructuring Española Way, you’ve been coined to develop the beach’s most sought after village, Sunset Harbour. Tell us about this experience? SR: Part of what I do – I never force myself on any area – I try to find out what the DNA of an area is. The DNA of Española Way obviously is completely different than the DNA of Sunset Harbour. Española Way is an all-night party, it never stops. It’s mostly tourists and connects Ocean Drive, Lincoln Road, and all of the hotels. Sunset Harbour is really a neighborhood-oriented street. Sunset Harbour, when I got there, we started to see neighborhood-serving businesses – workout places, gymnasiums, and restaurants that serve the locals rather than the tourists. Sunset Harbour’s DNA was really health, wealth, and welfare. So for me, it’s all about sensing what an area’s about. It’s about what the area wants, what the area needs, and what works best for the area. In redeveloping pockets of neighborhoods in South Florida, what are your plans for next? SR: My favorite area at the moment is Wynwood. We’re going to develop – my partner Philip Levine and I – a very cool, hip, chic hotel that’s arts-oriented because the DNA in Wynwood is arts and culture. So we want to develop a hotel where arts-oriented people will come, be comfortable, and have a place to stay. Wynwood doesn’t have a hotel yet. We’re going to get a super cool, hip hotel chain out of Santa Monica. What would you say is your ultimate favorite area in Miami? SR: My heart will always be in Miami Beach.